Say “Aloha” to one of our crowd favorites! 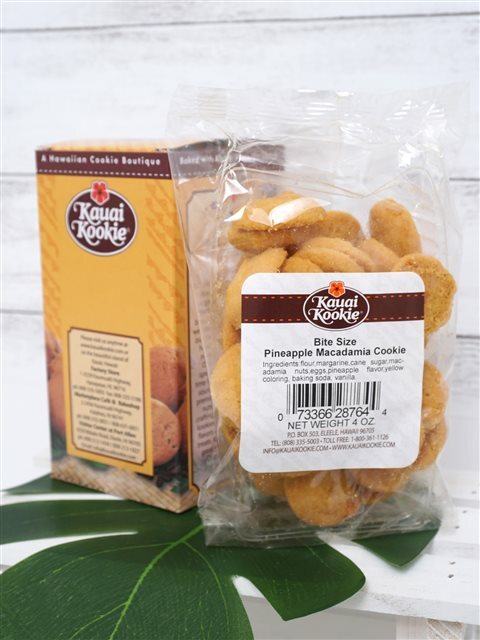 Here at Kauai Kookie, we have paid homage to the island of Hawaii with our delectable Bite-Sized Pineapple Macadamia Nut cookies. Sweet, tangy, and bursting with flavor, it is no wonder these cookies are one of our fan favorites! Each bite-sized morsel is chock full of sweet pineapple flavor and crunchy macadamia nuts for a rich mouthwatering cookie that is sure to delight your taste buds. With our Bite-Sized Pineapple Macadamia Nut cookies, we have added a tropical twist to our classic cookie.